Turns out the man’s name was Scott and he was a BicycleTouringPro.com reader who had recognized me from my photos on the website and knew that I was in the Geneva area for the start of the Bike Switzerland Challenge Tour. In fact, Scott was at the campground with his friend Tim, and the guys were just about to take off of their first day of long-distance bicycle touring the following morning. Tim was going to be riding with Scott for a little over a week or so, and Scott had plans to continue on his own for several months after that. We spent some time that evening and the following morning talking about our travel plans, work, etc, but we eventually went our separate ways and I’ve been following Scott’s travels by bike ever since. Since leaving Scott in Switzerland, he’s made his way to Poland, France, Spain and a number of other European countries. A few weeks ago, however, while stopped in Paris, France, Scott had his touring bicycle stolen from him…. and the events that followed are what I’d like to share with you. I wanted to share Scott’s story with you because there are two very important lessons to be learned here. First of all, never leave your bicycle locked up outside overnight in a big city. Never! You can leave your bicycle locked up for a few minutes, but never for an extended period of time. Generally, I try and limit my bicycle’s alone time on the streets to less than 15 minutes. If I can cut that time down to 5 or 10 minutes, that’s even better! Even when the bicycle is locked up, it should never be alone and on the street for hours on end. That was Scott’s first mistake. He should have brought his bicycle inside with him! It may not seem easy to bring your bicycle inside some places in the world, but you need to figure out a way. Even if you can’t bring the bike inside the apartment or hotel room where you are staying, there is usually a secure garage, closet, store room or hallway inside your building or a neighboring building where your bicycle can be kept. In some cases, you may wish to secure your bicycle with a lock even after the bicycle has been brought inside. Side note: When planning your places to sleep each night, always tell the people you are staying with that you have a bicycle. Try saying to them, “I am going to have a bicycle with me. Will that be a problem?” or “Do you have a safe place where I can store my bicycle when I get there?” If the answer is “No,” then you need to find another place to stay. It’s that simple. Secondly, Scott made the mistake of trying to purchase a bicycle for his long-distance bicycle tour that was not really designed for long-distance touring. This mistake cost him both a significant amount of time and money. I talk about this at great length inside my book, “The Essential Guide To Touring Bicycles”, because this is a mistake I see people making all the time. The problem with this strategy, however, as Scott quickly discovered, is that many non-touring specific bicycles fall apart under the demands of loaded bicycle touring. A non-specific touring bicycle will get frequent flat tires (as Scott experienced), be susceptible to multiple broken spokes, and in some instances, the frame of the bicycle itself will break apart (which as you can imagine, is super, super dangerous). Scott was able to realize very quickly that his first bicycle purchase was not a good one and he did a good job of speedily correcting his mistake. 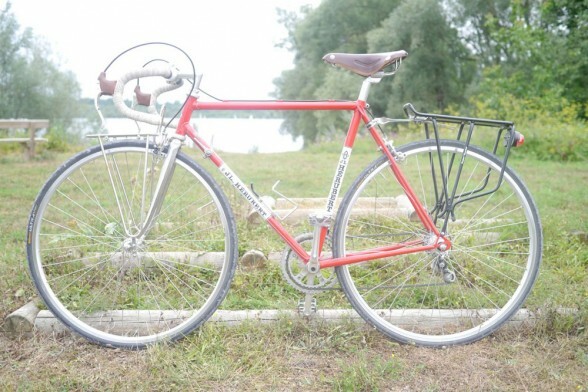 He did so by going to Rando Cycles (which as you would have learned by reading “The Essential Guide To Touring Bicycles,” is France’s largest and most well-known touring bicycle company) and securing a proper touring bicycle. The good news is, Scott is back on the road now and his new bicycle (a Surly Long Haul Trucker) is doing a great job of getting him from place to place. Scott will surely no longer be leaving his bicycle locked up on the street overnight… and after reading this article I hope you won’t ever make that same mistake! This entry was posted in Bicycle Touring Pro Articles, Bicycles, Featured How-To Articles, Lodging, Main Articles, Products, Safety and tagged big city bicycle locks, city bike lock, locking your bicycle, paris bicycles, rando, rando cycles, rando touring bicycles, scott and tim, stolen bicycle, stolen touring bicycle, the essential guide to touring bicycles, tim and scott, touring bicycle buyers beware. Great summary of the lessons I learnt and some good advice to help others avoid the same situation. It’s been a few months since the bike was stolen and since then I’ve stayed in a lot of accommodations over Europe. I’ve never had a problem finding a place indoors to lock up my bike since. Thanks for the summary. Not to beat a dead horse, but even bringing your bike inside and locking it is no guarantee in a big city. I’ve met a fellow who ended up losing his bike and panniers while sleeping in a hostel in Seattle, WA. This is one of those things that makes me suspicious and why I love to wild camp. A friend and I took off on a 40 day around Europe tour, he on a £250 hibrid bike (cross between a mountain and road bike), I on a £1300 touring bike. Ironically, it was my bike that got the punctures and I had to replace both tyres before the end of the trip. Also, I got overstretch pain, because my bike didn’t fit me ergonomically. There is a good chance that I carried the greater weight, so that might account for the unexpected outcome. The point being if you travel light, a modest outlay will do the job, at least for 3000 miles. We’ve just come back from a short tour along the Canal du Midi in Southern France. We had pre-booked accommodation and had no problems this time. The bikes spent three nights in hotel dining rooms, one in a conference room, one in a barn, one in a garage and one in a wine cellar. Being out of season helped, but everyone went out of their way to make sure thebikes were somewhere safe. However, we still locked them up. Hi Darren, I have a SLHT 700c x32 Schwalby Marathons that I understood would have less rolling resistance On my recent tour over the inland mountains from Brisbane to Coffs Harbour here in Australia, with front and back bags plus 2 man tent etc I had to walk many of the hills. This was my first multiple day tour and I can finish day after day with no aches, pains or stiffness. Having noticed Scotts big tyres similar to many really long distance blogers. My question is how do they negotiate the big mountain ranges of Europe and The Americas?. I have never heard tell of any walking . I look forward to less walking in the future. I guess i will develop stronger legs as I progress. In a few days I am about to enjoy The RACV Great Victorian Bike Ride. —- 9 days fully supported. [ greatvic.com.au ] Thanks for sharing your experience Scott. I really sympathise with you. Cheers guys, Barry. I’m not sure from your comment, but it isn’t really the tires that determine whether you have to walk the bike or not. Unless you are talking about cycling on sand or especially rocky roads. Is that what you are talking about? Or are you talking about walking your bike up steep hills? I walk my bike quite frequently, but it is usually 1) when going up a super steep hill or 2) when going around an obstacle, such as a giant pothole that spans the entire road, super rocky roads, etc. I guess I don’t understand your question enough to give you a very good answer. If you can clarify a bit, maybe I can give you some better feedback. In regards to your upcoming Great Victorian Bike Ride, that looks fantastic! I wish I could join you. Please let me know how it goes. In August 2008 me and my girlfriend were crossing California by bicycle when we stopped in a antiguity store to watch vintage posters. We left both bikes outside near the store. My girlfriend took a picture of the store and suddenly her bike disappeared of the corner. Immediately I stopped a sheriff car ( I had a good luck).In short time the sheriff ordered to close the exit road of the city and after 1 hour the police catched the thief on my girlfriend bike. It was a hard experience. Very poignant and informative. Thank you. I must say that I have enjoyed your emails very much and what originally I thought was spam turned out to be a great series of very entertaining mails. Thanks again and good luck with your present travels. Whether from the perspective of transporting your touring bike (via plane, train, taxi, boat or subway) or storing it, folding bikes have worked out better for my travels. For long distance touring on pavement, a 6 speed Brompton with reduced gearing, Brompton front luggage, fenders, rear rack, easy wheels as well as Brompton’s new LED dynamo lighting system is ideal. For touring on/off road, a Paratrooper Pro quality or higher full size folding bike from Montague is ideal. Fit the Montague with a trailer such as the Burley Travoy, Maya Cycle or EasyWheel because standard touring pannier racks will impede folding. With either of the above setups, you can pretty much take your bike anywhere you go (I even checked my folding bike at the coat check desk in the Louvre in Paris). While I mostly travel on roads, dirt tracks and hard packed rail trails with loaded panniers, customers have taken their load laden Montague’s into some pretty extreme places (Afghanistan, Iron Curtain Trail & more) without problem. As always, I appreciate your thoughts and ideas. My partner and I just planned for several days of cycling in Death Valley, one of my favorite places. Our bikes on fork locks Inside my camper shell with a 1/2 inch cable lock going thru them as well as 2 additional locks on the bikes. Someone broke into the camper shell, cut the locks and the cables and made off with one bike leaving evidence of an attempt to get the other but apparently interrupted in the process. This happened about 5pm just outside the hotel in Anaheim. The bikes were left alone only a couple of hours and it was still daylight. Very disappointing to say the least. We rented a bike and continued vowing to never leave a bike unattended regardless of how many locks are on it, if someone wants it and it is out of your sight, it is theirs for the taking. I read this like every article I recieve with great interest and although my plans to go touring keep getting put on hold for various reason outside of my control. I found this article full of what we all call common sense. I know of someone who never leaves his bike outside locked up at all. Even in the town where he lives which is nearby he often parks the bike inside a shop or a club where he is . Management don’t seem to mind. I have for a long time taken my bike and trailer into plazas and shopping centres and usually securing it to the metal grate of a roller door infront of an unoccupied shop while I go and do my shopping. I am fortunate in that I tend to go riding and shop at times and places that most of the these oportunistic thieves don’t. I still lock the bike up and have been known to lock the trailer up as well if I am not in a positin to take the trainer into a shop and put the items directly into the bike. My friend Dave and I just completed a ride from Canada to Mexico down the Pacific Coast Route. Although there are no huge mountain ranges along the way, there are plenty of climbs of varying length and difficulty, plenty of which we walked parts of, Nearly everyone we talked to about walking the bikes acknowledged doing so at least occasionally, (except for the high-speed, low-drag road racers in the butterfly outfits) so you are not alone. This included cycle tourists of every age and range of experience, with a lot of variations in bikes, tires, gear, and personal fitness. We found there were several things that could turn us into hikers with bikes. 1- Hitting tough climbs before you get warmed up. Both of us are over 60, and it would take a while in the mornings to work out the kinks. Walking for a while is better than injuries. 2- Stiff climbs on narrow, curvy roads with no shoulders. We wore bright orange reflective vests the entire trip for visibility (that got more positive comments than you would believe) but sometimes there is no margin for error. Much easier to watch traffic and protect yourself if you are not on the bike. 3- Days when you are tired, ill or injured. You don’t always have the luxury of not getting back on the saddle, but sometimes you just don’t feel like attacking another hill. The remaining variable is weight, and you have to balance what you want to take with what you’re willing to pedal uphill. Picking up a bottle of wine to go with dinner makes a lot more difference than the rolling resistance of your choice of tires. I hope you have a great time with the Great Victorian Ride- it sounds awesome! Not having to carry all your gear makes it a very different experience. Don’t know if it helps, but there’s my 2 cents. Darren, This subject came up several years ago on your site and I suggested using a driveway alarm to protect your bike while in a store etc. I still carry mine and also use it in campsites when I want to know if someone or something is in my camp. When I use it to protect my bike while shopping I leave the driveway transmitter on the bike, ( point it in a direction that won’t be ‘seeing’ people walk by, I often point it at the ground so if the bike moves it will be set off} and take the receiver with me in my handlebar bag. I’ve only had one alarm from it and it was a little embarrassing to be running through the store with the alarm going off in my bag, but much rather that than the embarrassment of a stolen bike. It turns out that incident was apparently a false alarm, maybe the wind. They are a little bit heavy, I keep wanting to try substituting AA batteries for the Ds but haven’t yet. The one I use has a range of 700 feet in good circumstances. One thing I have learned from using it over time is when I pack the transmitter away in my panniers is to put it where it won’t see movement, otherwise it will wear down the batteries on the transmitter. The receiver can be turned off so that isn’t a problem with it. 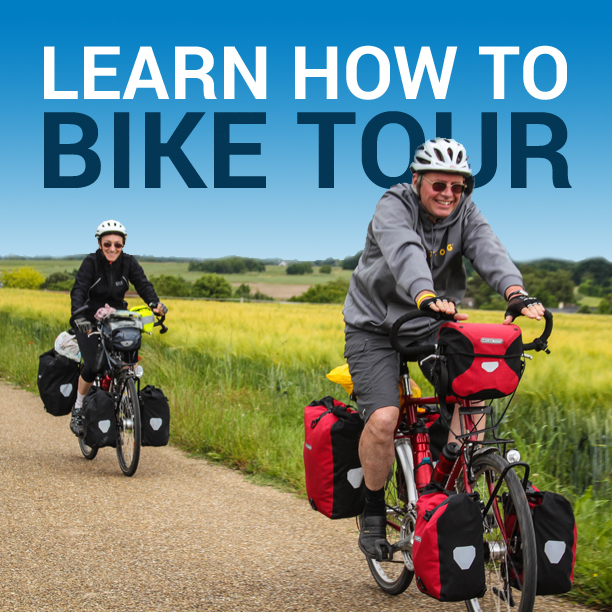 I enjoy your site and appreciate all you do to promote touring by bicycle. I was a bike messenger in New York City for a year (but lived there longer, in addition to other cities) and I cringe when I see people here in Austin leave their bikes unlocked. They leave high-end bikes of all kinds as well as crap beater bikes. It’s astonishing. I’m with you about never leaving a bike locked outside for an extended period of time. When I rode to non-messenger jobs, I used a heavy U-lock for the front wheel and frame with a secondary cable lock around the rear wheel, frame and seat. I know other people who super-glued a ball bearing inside Allen bots to prevent theft of handlebars or cranks (a blowtorch frees the glue). I also locked my bike the past two years at Burning Man, including in my camp. I have a small flimsy cable lock for the bike rack (which I won’t need soon since I’m selling the car). I don’t go anywhere without a lock and a small bag with some tools and puncture repair stuff (another thing people seldom have to my amazement). Although I haven’t started any long-term tours yet, I plan to and I’ll have a bike lock with me. I live in British Columbia and over here, hills and mountains are the norm. I own a Disk Trucker which came stock with the Surly drive train. 26/36/48 and an 11-32 cassette. I recently upgraded my cassette to an 11-36 to see if that makes a difference and if it is still not enough, I will change my front chain ring to a 22/32/44. Around here, it is all about being able to climb. If not, you do a lot of walking. When touring, if I have to leave the bike to go in a store or any place I take the front wheel with me. I also have panniers with handles and I usually take the one that has the valuables in with me. Plus I take my handle bar bag with strap. Sounds like a lot but there aren’t many theives that can ride a one wheel bike.